Review: The Company You Keep / It's Just Movies Review: "The Company You Keep"
Robert Redford can have his pick of just about anything he wants to do. At 76 years of age, he chose to produce, direct and star in “The Company You Keep,” which is an investigation into the minds and times of the Weather Underground. This film is the story of a small branch of the 1960s to ‘70s peace movement that influenced a few members from the Students for a Democratic Society (SDS) to form the Weather Underground, a radicalized splinter with a mission to foment a revolution. Redford has given us an uncomplicated, fictionalized version of the story based on the book (by the same name) by Neil Gordon. The names have been changed and the stories collapsed. The central incident, the attempted robbery of a bank and murder of two policemen and a guard, is based on an attempted Brinks armored car hold-up. The murders are absolutely, unfortunately, regrettably true. But what happened to lead these young peace activists to such a desperate action? This central issue was not fully explained, though it is inferred that the WU was involved in a more general protest against the capitalist system and its support of the greater industrial complex that financed all the governmental activities and policies that the peace movement protested. However, this WU “demonstration,” like others that involved bombing banks, the Pentagon and other government buildings, is not on the original Gandhi peace model SDS students originally idealized. 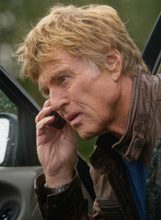 Redford’s film, showcasing an exciting veteran cast, focuses more on the human side of these WU events. The members felt deeply. They were passionate. It’s just that, as Redford’s character notes, they made mistakes in how they should have focused their energies, and the robbery with its violence was just one example. He more or less credits the impetuosity and idealism of youth with the WU’s errors of judgment. However, the biggest problem for this film is that its fictionalized version of the truth doesn’t explain enough. The first distracting problem is that as a celebrated liberal, why did Redford allow himself to be portrayed as an aged but fit oldster with an 11 year old daughter? If he’s just a fictionalized character, why not make her a grand-daughter? Why the illusion to marrying a woman at least 20 years younger? Then there is Susan Sarandon’s role that begins the film that is never resolved. I didn’t understand why her intent to turn herself in resulted in an armed capture at a gas station. Nor is there any follow-up to show what happened to her in the court system. Last is the role by the lovely Julie Christie. Juxtaposed with the formidable Sam Elliott, I didn’t understand their relationship or Christie’s reasons for causing a trail of emotional pain in other arenas. This is a brave film covering a pivotal moment in US history when the government lost its sacred trust and citizens revolted. It is also a brilliant cast. However, instead of basing the film on the book I would have preferred a true investigation of the real Weathermen and their history. This trumped up story has too many questionable aspects and loose threads that never get resolved. Follow Bev Questad on Twitter at http://twitter.com/questad.